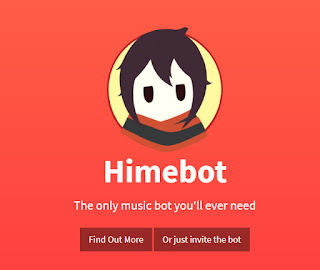 .pl | .play shuffle song/url/playlist/autoplay: Plays a song or playlist with the given link or song, a link is required for any song that is not on youtube (also use this to invite the bot to the voice channel). You can use .play shuffle playlist_link to shuffle a playlist before playing or use .play autoplay to play the autoplay playlist. You also can do .play scsearch:song to search for a song from soundlcoud and play it. .voteskip | .skip: Vote to skip the current song. .prev | .previous: Enqueues the previous song. .jumpto | .skipto song_index: Skips to a song based on the .songlist index. .seek duration_in_seconds: Jumps over the given amount of seconds in a song, you could also jump backwards with something such as .seek -10 which will jump back 10 seconds. .modskip | .forceskip: Forceskips the song as a DJ or an admin. No need to vote. .search song: Searches for a song on youtube and lets you to queue it, add scsearch: before the song to search for searching on soundcloud. .stop | .leave | .diconnect: Stops the current song and queue. Doing .stop 2 times will make the bot leave the voice channel. .p | .pause: Pauses the current song. 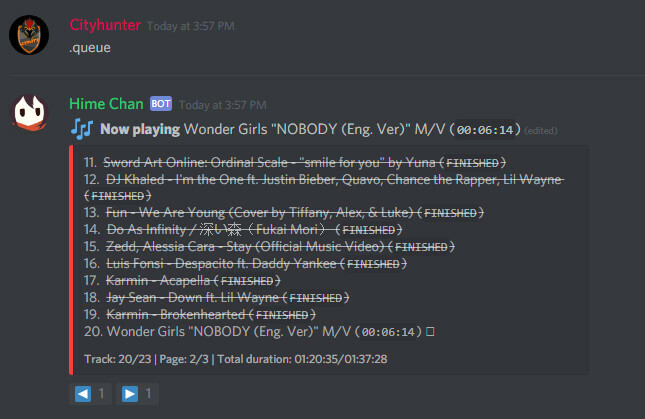 .rq | .clearqueue | .reset: Removes all entries from the music queue, though this doesn't make the bot leave the voice channel unlike .stop. .re | .resume: Resumes the current paused song. .sh | .shuffle: Shuffles the current queue. loop | .repeat: Sets the repeat state of the current song queue to either True or False. .queue | .q | .songlist: Shows the current queue of songs. The queue is interactive, you can click on the reaction emotes below the message to switch between pages. .np | .nowplaying | .current: Shows info about the current playing song. .delete | .r | .remove song_index song_index_2, song_index_3...: Removes a song based on the .songlist index. You could also remove multiple songs by passing multiple indexes. .mov | .playafter | .move song_to_move position_in_queue: Moves a song based on its index to a position in the queue. If no position is given, the position will default to 1, which means the song will be played right after. .vol | .volume 1-100: Sets the player volume in %. .aliases add/remove alias link/name: This command allows you to create specific aliases for songs/playlists if their names are too long to write or if you can only play them by their links. Once you have created an alias, you can then play it using .pl alias. This is very useful if you don't want to copy paste the link or name every time. .partners: Shows the partners of the Hime. If you would like to become a partner then please msg init0 in Hime's server using .invite. 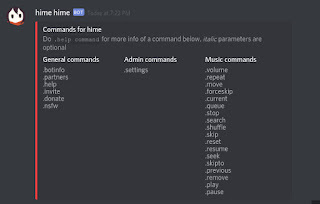 .help command: Gets the info of a command, list all commands if command is omitted. .info | .stats | .botinfo: Shows some info about the bot. 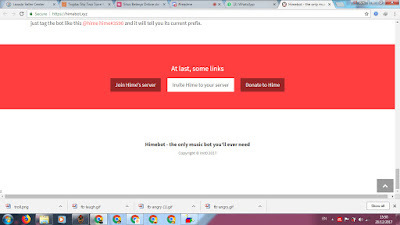 .links | .invite: Shows the invite link for the bot, aswell as some other links for things such as the website, patreon and discord server. .ping: Pings the bot and show the latency, use to check if it's lagging or not, the higher the ping is the more laggy it is. .settings dj | tc | vc | autoplay | tms | prefix value: Shows the bot's settings in the server. You could change the listed settings using this command. dj: Sets a DJ role for the server. Values: NONE, @role. 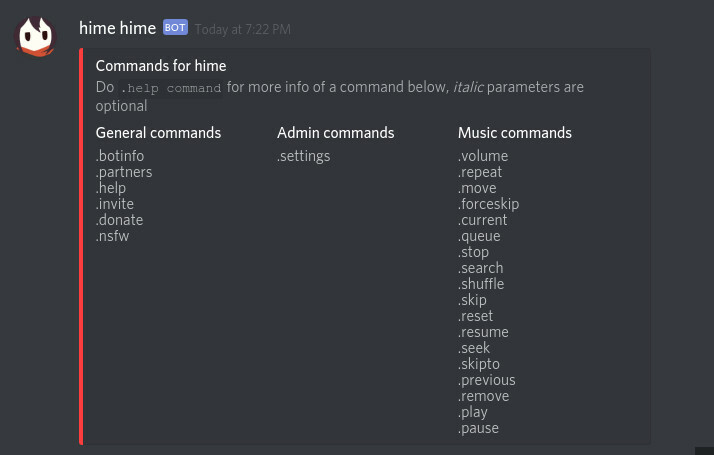 tc: Sets a text channel for using Hime's music commands and stuff related to music. Values: NONE, #channel. 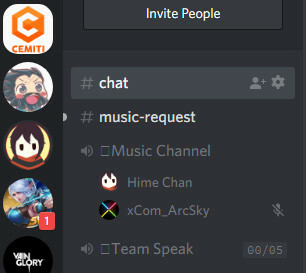 vc: Sets a voice channel for Hime to play music in. Values: NONE, name of voice channel. prefix: This is the most dangerous setting, the prefix is a character that each of the commands starts with, the default prefix is . though you could change it to something else such as !. Values: NONE, prefix_character. 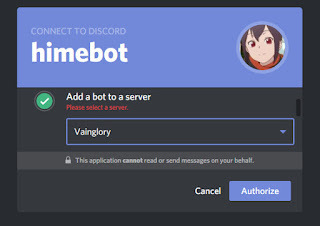 Beware that the bot will not respond if you try to invoke a command using the . prefix after you've changed the prefix. If you want to change it back, then just tag the bot like this @hime hime#3590 and it will tell you its current prefix. 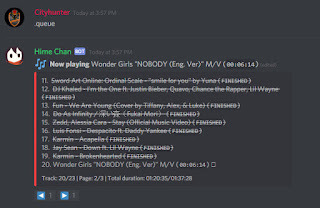 4 Komentar untuk "Membuat Bot Music pada Discord Server"
cara menambahkan ke playlist gimana ya ? Min cara nambahin lagu ke play list gmn caranya?